Écrite et coréalisée par l'humoriste et acteur Dax Shepard, cette comédie au budget modeste réserve des poursuites automobiles peu excitantes et un humour politiquement incorrect qui manque de punch. It probably was fun to drive all these hot cars around California, and make a movie with your friends and sacrifice plot logic for better jokes. But where's the fun for the audience in all that? But the movie is too squeamish and dumb to treat this strand as more than a passing notion. It is just another prank in a comedy that feels as if it were dreamed up in the wee hours between bong hits and shots of tequila. Many off-screen couples can't really translate their chemistry to the big screen, but Shepard and Bell - who seem to be playing characters not unlike themselves, definitely have good chemistry. This slapstick road movie feels tossed off by people on a raunchy bender. I mean that as a good thing. 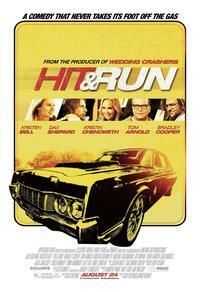 The trouble with Hit and Run is that it can't sustain its trippy effervescence. On-the-run love story delivers charm despite some unwise detours. Alors que reste-t-il? Une espèce de romance avec des dialogues dont l'humour tombe à plat, un film d'action qui n'en possède pas des masses et des acteurs, tous amis, qui ont dû s'éclater pendant le tournage, mais dont l'enthousiasme n'est pas communicatif. Bénéficiant d'un rythme assez maintenu, lequel ne fait pourtant pas oublier l'effet de répétition des poursuites, Hit and Run arrive cependant à destination de façon précipitée comme si Dax Shepard, aussi scénariste, avait manqué de gaz en fin de parcours. Like the muscle cars it lovingly features, Hit and Run idles effectively, revs and takes off with frisky energy, and knows just when to cruise.